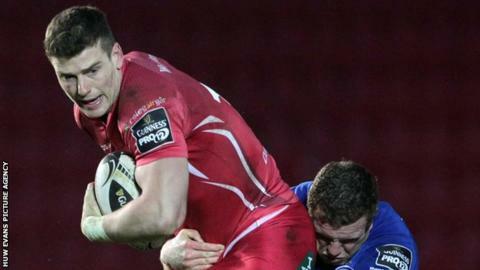 He said it is "exciting" his career will continue at Parc y Scarlets. Williams has been on a national dual contract since March, 2015, but the WRU's controlling interest in the player will end in the summer of 2016. He is in his second season as Scarlets vice-captain, but has been sidelined by a knee injury since Wales' 2015 World Cup win over England at Twickenham. Jonathan Davies returns to Scarlets from Clermont Auvergne for the 2016-17 season to partner Williams in midfield. Cardiff Blues: Sam Warburton, Gareth Anscombe. Ospreys: Alun Wyn Jones; Dan Biggar; Dan Lydiate; Rhys Webb; Scott Baldwin; James King; Rory Thornton; Dan Baker. Scarlets: Jake Ball; Scott Williams; Samson Lee; Rhodri Jones, Jonathan Davies (from 2016-17). Newport: Gwent Dragons: Tyler Morgan; Hallam Amos. Davies, a 2013 British and Irish Lion, has signed a national dual contract to return, giving Wales a controlling interest in him. It means Davies' Scarlets game time can be limited to under 20 appearances per season while Williams will be more freely available to them. Scarlets coach Wayne Pivac said: "Having him (Williams) and Jonathan Davies in the centre next season is going to be very exciting." Williams added: "Continuing with my rugby development in Wales was vitally important to me. "I'd like to thank the Scarlets board and backroom staff who have been supportive throughout the negotiations."